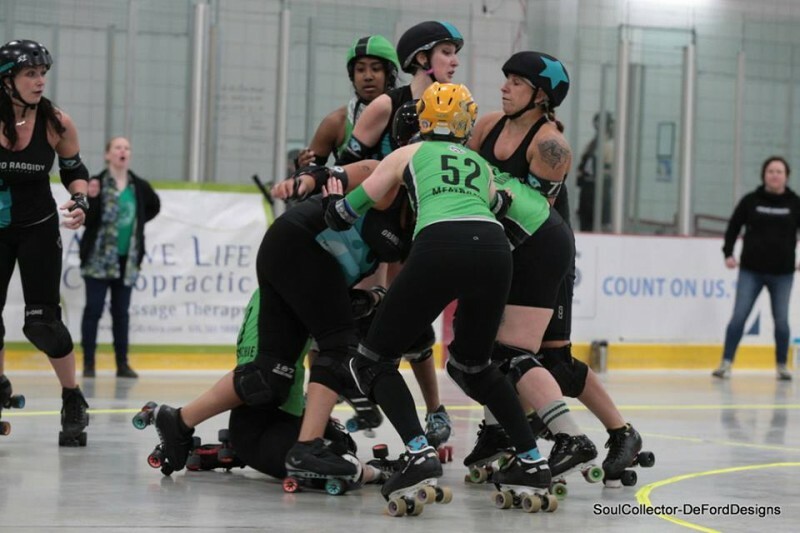 Grand Raggidy Roller Derby will be hitting the track Saturday, April 13th, hosting Flint Roller Derby and the Ypsilanti Vigilantes in a doubleheader held at MSA Woodland. The All Stars face off against Flint and the Attack take on Ypsilanti. Grand Raggidy Attack will be coming off a loss to the Royal City Rum Runners in their season opener 276-102, a substantial improvement from their last meeting, but leaving them hungry for a win. Attack will be led by a solid four-jammer rotation including Dos Cinco, Ann O’Steel, Misty MeanHer, and Attack co-captain, Dutchruction. Dos Cinco is an athlete to watch as she led the jammer scoring with forty-seven points last game and has swiftly improved her skill. With co-captain Knight of Slamalot, the blocking charge will be ignited by Attack veteran Vibrant Vengeance, Eleanor Wreckby, Shoggi, and Geez-Louise. According to Knight of Slamalot, Attack has made a few changes and worked on some different blocking tactics which have held up strong in practice and scrimmages, hopefully carrying over that success against the Ypsilanti Vigilantes, a strong affiliate with the Ann Arbor Derby Dimes.